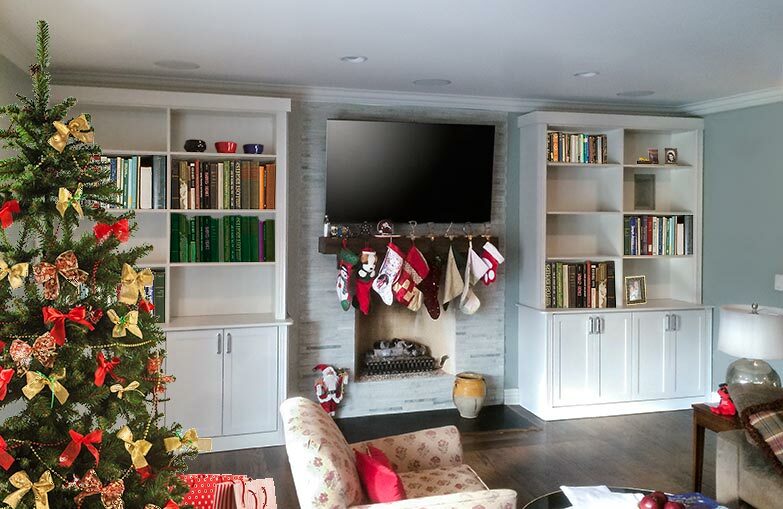 Custom book cases, media centers and wall units can be a great way to add functionality to a family room! Closet Works designed this wall unit to hold books and treasures on the upper open shelves, and included cabinet space on the bottom to conceal all the video game systems, home theater equipment and audio components. The upper bookshelves come in handy for this household with several children. The wall unit supplies enough shelving to keep favorite story books handy for bedtime reading, while the lower cabinets conceal all the video games, controllers, consoles, as well as board games that can easy overwhelm any family room when many children are in the household. The central focus of this family room is the hearth. It is a place for the family to gather and make lasting memories. This wall unit fireplace surround enhances the cozy, family focused nature of the room with it's dedicated space for books, games and activities, while keeping the space tidy and uncluttered at the same time.